So let’s say you are a planner. You’re probably looking up at the visual and thinking to yourself—"yup, I do a lot of that”. Or maybe you’re a designer (or design strategist) and you might be thinking the same thing. Or you could be a business analyst or brand strategist and think “yeah, I do that”. Maybe you are an interaction designer, writer, information architect or creative director and feeling the same way. Maybe you aren’t any of these. Could it be that you are a human “synthesizer”? I believe that the more options technology gives us—the more complexity, and potential—then the more important it becomes to hone in that core set of "truths" AND be able to articulate them to a diverse set of project influencers. The reality is that while many of us think we have this ability—few probably do it really well. But you know it when you see it, they are the ones who are able to cut right through the distractions—to the essence of the problem. But they don’t stop there, they are able to tell stories which move people to a point consensus or action—or just move them period. Synthesizers help take the inputs, distill them into something meaningful and articulate and output them in compelling, meaningful ways. I believe that these soft skills are needed now more than ever because design, technology, business, brand and human needs have never been so intertwined before—so co-dependent. Like good designers and planners, synthesizers possess a healthy dose of empathy. But they can also look at things from a business perspective. 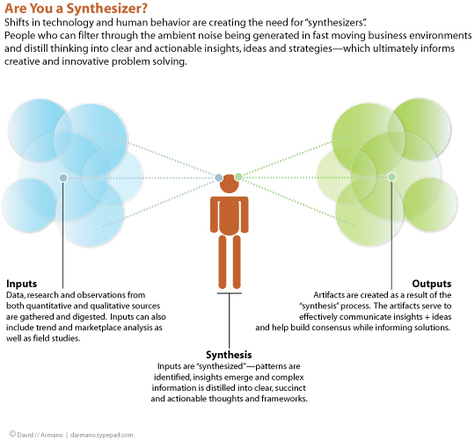 Good synthesizers can be analytical—but operate enough on intuition to not over analyze. I wouldn’t be surprised if synthesizers tend to be fuzzy, T-shaped, or generalists—they would need to be able to go deep in certain areas, but also look at things holistically. But one of the most important traits of a synthesizer is the ability to produce a set of “outputs” which moves insights from the abstract to the concrete. To put this in perspective, a good synthesizer crystallizes the problem which needs solving for—so the solution process can begin in an informed fashion vs. a more arbitrary approach. This is where competencies in design thinking, and storytelling become critical. Synthesizer does not = job title. Let’s be clear. Being a synthesizer doesn’t require you to trade in your job title. But, here’s the question I would pose. Does your organization see the need for this kind of skillset? Not only do I think it’s needed, but I think it may come not only from one person, but a group of people with complimentary strengths. And often times this kind of thinking can emerge from outside the areas where you would think they should reside. Research without synthesis usually ends up being raw data—which is important, but data alone has never led to effective solutions, great work or innovation.